3 drawings on paper (1 sheet) : ink ; top image 6.375 x 6 in., bottom left image 3.125 x 3.375 in., bottom right image 3.125 x 2.625 in., on sheet 9.5 x 6 in. Ink sketches of costumed performers, identified by inscriptions in Japanese, performing a Kabuki play, reciting poetry and dancing for a talent show on February 1, 1943. Top image is composed of five sketches dancers in male and female Japanese costumes performing the auspicious New Years Kabuki play "Rosho Sanbaso". Three sketches in top row of a man seated in profile facing right with a tall hat, a female dancer facing forward, and a man seated facing forward wearing a tall hat. Bottom two images of a female figure dressed in a kimono facing viewer with hands in lap and eyes downcast and a man wearing a tall hat dancing. Bottom left sketch of a man, Mr. Sakurada, dressed in hakama dancing "Kii no Kuni" about country of Wakayama in front of a pine tree backdrop. 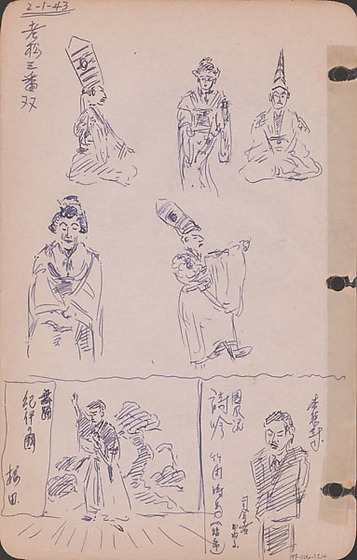 Bottom right sketch of a man, Mr. Takeuchi, standing in suit with arms behind his back reciting poetry in the Koku style. There was a change in the toastmaster. Drawing 97.106.1CI on verso of same sheet.